Despite this romantic idealization of city life, there’s one thing that most car-dependent people simply can not understand. How do you shop for groceries? Putting aside Fresh Direct or any grocery store that delivers, how do you lug home enough food to stock your fridge for a week? How can you possibly carry so much? Isn’t it easier to drive? The short answer, in my opinion, is no. 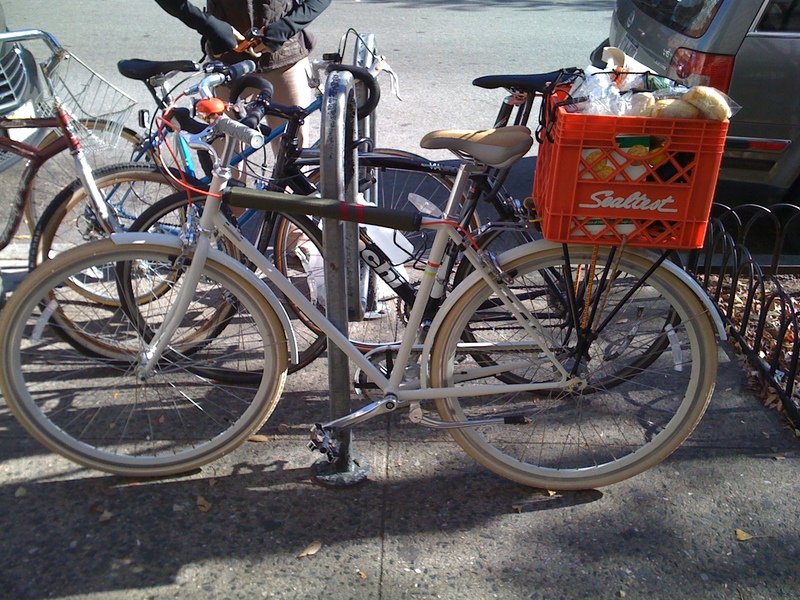 I live less than ten minutes by bike from the Brooklyn Trader Joe’s. Before I started running errands by bike, I’d use a number of means to do my shopping. I’d walk, carrying a bag or two home. I’d take the bus, but that didn’t increase the amount I could carry. Occasionally, I’d rent a Zipcar, but that brought with it a whole host of inconveniences. I did a grocery run on my bike yesterday, and loaded up a backpack and the red milk crate, pictured, with groceries, some heavier than anything I ever would have been able to carry had I walked. Sure, I can’t take home in one trip as much as I could in a car, but there’s an advantage to that. Here’s why I think biking, not driving, is the way to run basic errands such as grocery shopping. 1. Driving a car adds to my grocery bill. Zipcar? That’s forty bucks, minimum, so I have to run other errands make it worth it and worry about returning the car on time. Car service? Twelve bucks. Even taking the bus adds $4.50 to the total. If I lived in the ‘burbs where those things aren’t a factor, I’d still have the monthly costs of car ownership. Riding is free, and has the added benefit of helping my bike pay for itself. 2. Even if I can’t get everything I need in one trip, I could make two or three runs and still spend less time on my bike than I would looking for parking if I drove. I’ve shopped at grocery stores in the ‘burbs and finding parking, even in a giant parking lot, can still involve a fair amount of cruising around. 3. I only buy what I can carry. A disadvantage to anyone with a windshield perspective, no doubt, but since I don’t have room for that impulse buy–the pint of ice cream, for example–I tend to only get what I absolutely need. This saves me money and calories. 4. However, if I do have some spare room and I decide to add a treat to my shopping cart, I know that I just need to ride a few extra blocks out of my way to start working off the calories. 5. I rarely have to think about what time it is. If I drove or took the bus, I’d have to worry about traffic. On a bike, I only have to think about how long the check out might be, a not insignificant factor at Trader Joe’s. Wonderful! I say this as I am about to leave on a grocery run by bike myself. 🙂 I especially love #3. I live in a rural area, and my trip to the store is about 14 miles (round trip). While I do my hauling on an Xtracycle, and can carry a very ample amount, I often find myself reconsidering those impulse purchases – do I really need/want to haul this home? I also love that it turns a mundane chore into a ride, a chance to be on my bike. Thanks! I agree. The joy of being on my bike should have warranted its own spot on this list. We bought a burley trailer to carry our kids (when they are not riding their own bikes, which is often) and it has come very handy. We often go to Costco and bring back an entire shopping cart worth. And last sunday someone gave away a 46″ TV for free and I picked it up with the trailer. I wish I could have a trailer or a cargo bike, but unfortunately we have no place to store it. Our building has bike parking, but it’s limited to traditional bikes only. We have a baby seat, but it lives in a closet in our living room when it’s not on the bike. I saw that tweet. Proves that you don’t need a car for everything! Spoke, look into the Ahearne Cycle Truck or it’s mass-produced cousin, the Civia Halsted. They are the same length as a traditional bicycle but can carry more than an extracycle. I love my Ahearne (see link above) because it carries everything and still fits in the elevator.